Part of being a beekeeper is becoming aware of the yearly cycle of the Seasons. It’s amazing how disconnected humans have become from nature. I am reminded of this every time a friend or co-worker asks me in January or February if my bees are, “……making any honey?! ?” It doesn’t take long to determine that activity within the hive is totally dependent on the time of year and Season. Bees have seasonally dictated routines. Being aware of this routine and adapting routines of your own will help increase efficiency in your beekeeping methods. One of my yearly rituals is deer hunting so I spend a lot of time in the woods every fall. It’s an important time of year for us to stock our freezer’s with wild game AND since I’m out in the woods anyway it’s also a time for me to collect smoker fuel. 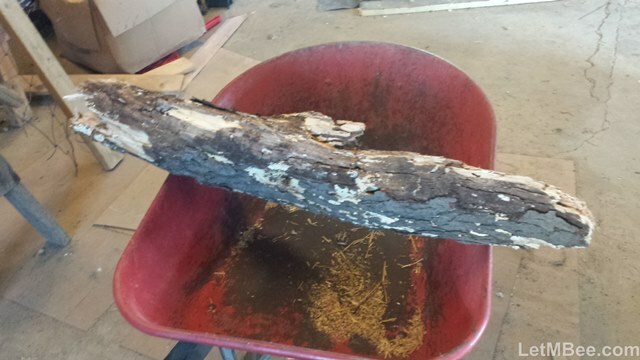 My fuel continues to be a mixture of TWO components, Punk Wood and Pine Needles. I did posts and video on lighting a smoker several years ago (See How to Light a Smoker and Deer Stand and Smoker Fuel). It is easy to light a smoker when it is filled with pine needles and punk. When done correctly the smoker will stay lit, smoldering for hours and you will not have problems with it going out. There is currently WAY more stuff out there for beekeepers to buy than is necessary. One area that this is nauseatingly obvious is SMOKER FUEL. It’s amazing the selection of materials that are marketed for this application. 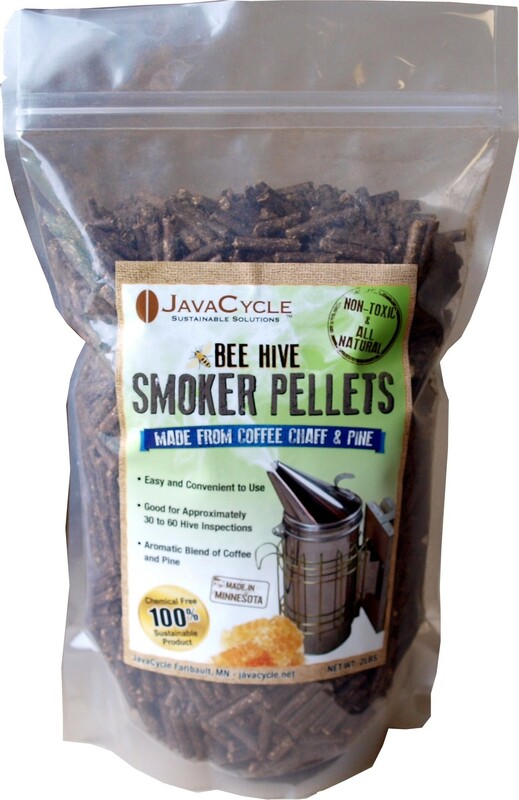 Burlap, cardboard, wood pellets or cotton plugs will ALL work in a smoker, but come on…. do you really need to buy everything? That being said I have used several of these fuels. I had trouble keeping burlap and cotton plugs reliably lit for long periods of time unless periodically working the bellows. I felt that cardboard created a HOTTER smoke thank I liked. It got me thinking after a while…. “I wanted to keep bees to be more self-sufficient…?! ?” I couldn’t see Hill-People in early North America or Egyptian’s, 2000 years ago buying smoker fuel..
A lot of the commercially available options come in 1 pound plastic bags. 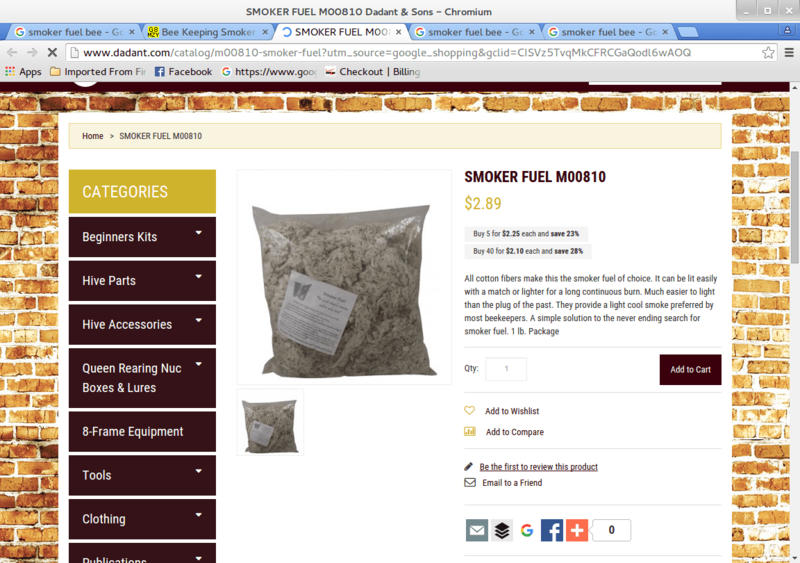 I was once a new beekeeper… and my receipts from 2009 or 2010 will show that I once purchased smoker fuel, but no more! I don’t know how you can be a beekeeper and NOT be at least a little environmentally conscious. Wild-crafting your smoker fuel has to be better than shipping it around the world in plastic bags. If you feel you MUST give someone money in exchange for smoker fuel SEND ME AN E-MAIL!! I will send you 100% organic, natural, smoker fuel, but it will be expensive. When you see how easy it is you’ll never worry about smoker fuel again. This time of year is great for obtaining both the pine needles and punk. The best way to gather needles is to pick a dry day. 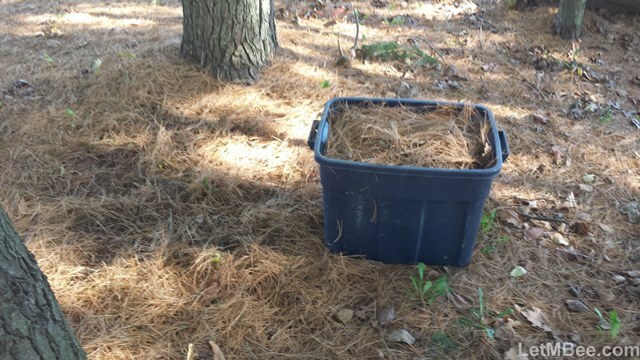 After finding your pine trees, try to scrape off THE TOP DRY LAYER of needles. The fresher needles will perform better in the smoker and smell better. If some twigs get in there no biggie, they’ll burn too. It doesn’t take much surface area to fill a rubber bin. Leave gathered punk in large pieces over the Winter to dry out. After the materials are gathered, put them in a dry place and forget about them until late Winter/Early Spring. Leave the lid off of whatever container you gather your needles in. Both fuel materials will benefit from drying. When it is time to start supering next Spring everything will be ready to go. This is just going to be a part of your yearly cycle now… right after…. PLACING MOUSE GUARDS so get used to it. We come from a long line of hunter-gatherers so even if you’re NOT a hunter, it’s good for you to get out and take a walk in the woods. Take the chance to explore…. look around….. Get out there and see what’s going on in this awesome world! Just go on a quest for a pine thicket AND look for wood on the ground that feels feather light! You will have a key ingredient for your beekeeping in 2016 and enjoy the health benefits of time spent walking around in the woods. SPECIAL NOTE – Make sure you have permission to go on private land this time of year, AND be aware of Hunting Seasons that may be going on when you are thinking of going to the woods. 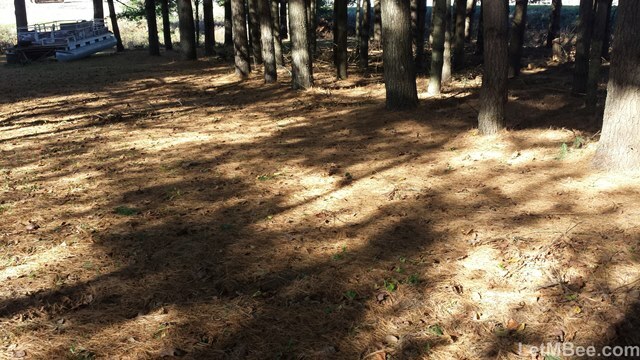 Crazy as it may seem there may be laws against taking pine needles off of the ground OR picking up some rotten logs. Look into it. Don’t get in trouble and BE SAFE! What are you using for smoker fuel? Are there any OTHER common supplies we could avoid buying? What Yearly-Routines have you developed? This entry was posted in HowTo, Methods, Posts and tagged bee, beekeeping, Indiana Beekeeping, smoker fuel, Treatment-free. Bookmark the permalink. Hi Jason I’ve been reading your blog from the start like a book. I live in the beautiful county of Northumberland in England. I got my first bees in the spring of this year& just started looking after them in the best way I could. It seems like there’s a really different vibe to beekeeping in the uk to usa so I’ve enjoyed reading& thinking about your approach. I’ve not treated just because I wasn’t sure where to start but now I know I’m not going to on purpose! I have fed but will try not to next year. I’m really looking forward to trying out some traps next year- not sure if it will work the same here as we prob dont have the wild honeybee population that you do, but you’ve given me some good ideas of places to try! You’ve really helped me figure out what kind if a beekeeper I want to be, and to begin to learn to trust the bees. I hope you& your famy have a great christmas& your bees prosper through the winter! I just cannot imagine living where there aren’t bees to be found, but I didn’t always think that way. Prior to getting bees I presumed there weren’t any around here. Fact is that here… Where you find HABITAT you find bees. Nature works that way. Look at the Trapping Reference. The best advice I can give you is build nice large (~35 L) traps, at least 15 of them, cast a large net with traps in locations you have thought about in likely locations, AND STAY OF LADDERS! 🙂 If you DON’T catch in an area for 2 or 3 years leave it, and look elsewhere. Buying bees is a short terms strategy. Trapping is a much more sustainable long term strategy. It’s gonna take time, but once you begin having success.. you’ll be hooked. Good luck with your bee endeavors. If you have questions about trapping leave comments on the Trapping Reference page. Thanks for reading and commenting.